As we would now expect from the Panagor, at maximum aperture image definition away from the centre is poor. At f/11 there is quite considerable improvement, though the very edges and of course the corners do not match the sharpness seen in most other shots. Tests of this Sonnar on its own show what it can achieve. Coupled with the Arsenal 2× converter, I would expect excellent results. Subsequent to completing the original lens tests in Hitchin, I purchased the 3M-3B Arsenal 600mm f/8 mirror lens. It does not have the cosmetic finish of the lens in the picture in my 1989 Technointorg catalogue from Moscow, which shows the standard pyramid studded ribbing that has been common on most lenses for the past 30-odd years. Instead, it has fine straight fluting (narrow straight lines) running along the length of the wide focussing ring. Some other MF lenses that I own have this finish. According to the serial number, it was manufactured in 1974, but it looks brand new. It has a 52mm × 0.75 rear-fitting filter in place. The filter is not labelled, but I assume it is UV. It is in a standard filter mount, with (as is normal with filters) a female thread on the front surface. This is turned round, so that it points backwards when mounted. A narrow retaining ring is screwed into the 'front' thread of this filter. 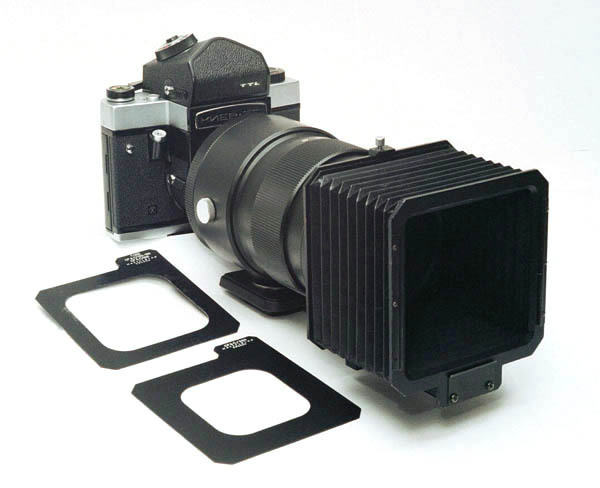 The ring has a wide ribbed flange that facilitates attaching the filter onto the back of the lens. It would be easy to replace the particular filter that is in my lens with another filter of one’s choice (for instance, ND). Of course, the Kiev 60 prism also shows the whole focussing screen, which the Pentacon Six and Exakta 66 prisms do not. This is generally considered a good thing, although it does take away the “safety factor” margin to allow for unavoidable cropping in most enlargers and slide mounts or the avoidable (?) cropping by most labs. “3M-3B” or “ZM – 3B”? The “3M-3B” should perhaps be called “ZM – 3B”, if you “translate” the first symbol, which I believe is actually a letter of the Russian alphabet, not the numeral 3. I have also transliterated to “B” the final letter of the lens name. This is the Russian capital “b” – similar to a Roman alphabet lower case b with a bar across the top to the right from the vertical upright. This equals a “B” in English. This is the symbol used by the manufacturers to designate lenses with a Kiev 6C / Kiev 60 / Kiev 90 / Pentacon 6 mount (also subsequently the Exakta 66). For lenses with the Salyut / Kiev 80 / Kiev 88 lens mount, they use the Russian letter which looks like “B” and is in fact the equivalent of the Roman alphabet letter “V”. You can see why I always specify the CAMERA that the lens is to be used on, as well as the designation – one could so easily end up with the wrong mount, through a misunderstanding! You can see a further explanation of this, with illustrations of the letters, here (near the bottom of the page). There is confusion among Russian online sources as to whether N1-L3 (Russian: Н1-Л3) or N1-LZ (Russian: Н1-ЛЗ) was intended, because of the similarity of the Cyrillic letter Ze for "Z" and the numeral "3". Sometimes both forms are used within the same Russian website (or even the same article). English sources refer only to N1-L3. The correct designation is L3, representing one of the five branches of Soviet lunar exploration. Stage 1 (Л1) would be a crewed circumlunar flight (only partially realized); stage 2 (Л2) would be an unmanned lunar rover (realized as Lunokhod), stage 3 (Л3) would be the crewed landing, stage 4 (Л4) would be a manned spacecraft in lunar orbit, and stage 5 (Л5) would be a heavy manned lunar rover to support a crew of 3–5 people. It is interesting that even Russian sources get confused here. Naturally, the Russian letter “Z” does not get confused with the numeral, when it is part of a word, and the numeral “3” does not get confused with the letter, when it is part of a sequence consisting entirely of numerals. The problem can arise with product codes, such as with this lens and with the above rocket, which are likely to contain an unpredictable combination of letters and numerals. The website address is https://en.wikipedia.org/wiki/N1_(rocket). This paragraph is near the end of the article. I consulted it on 6th February 2018. This lens was manufactured at irregular intervals over a period of approximately 20 years, to judge from the serial numbers (in which the first two digits show the year of manufacture). One would have expected that the earlier lenses would have had the fluted design to the focussing ring (as in the lens illustrated in my photos above) and that the later lenses would have had the pyramid studded finish that was illlustrated in the 1989 Technointorg catalogue from Moscow. 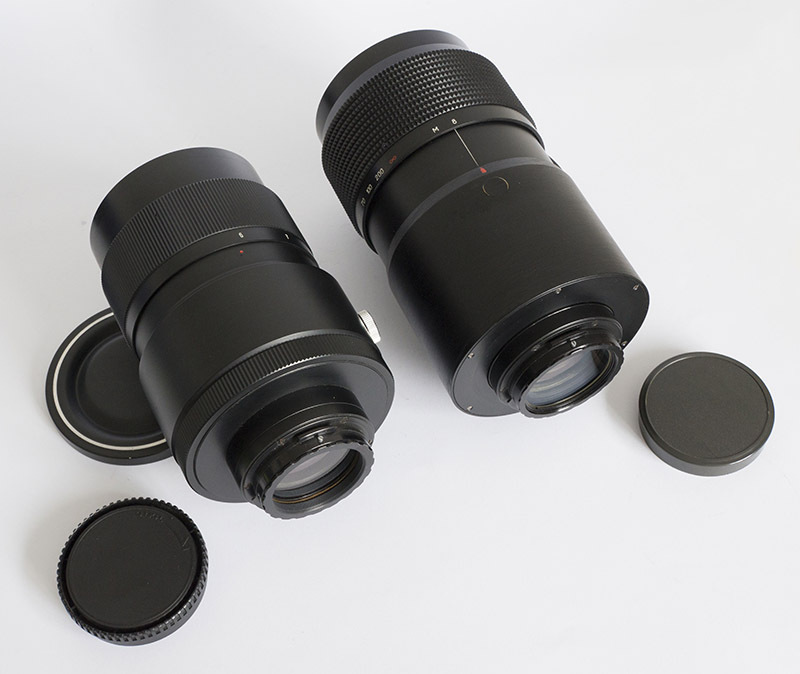 However, a study of the serial numbers that have been seen for this lens indicates that the style switched backward and forward without any obvious pattern. I would suspect that components that were not required for an early batch of the lenses were stored, and subsequently rediscovered and used, even after some lenses with the pyramid studded finish had been introduced. 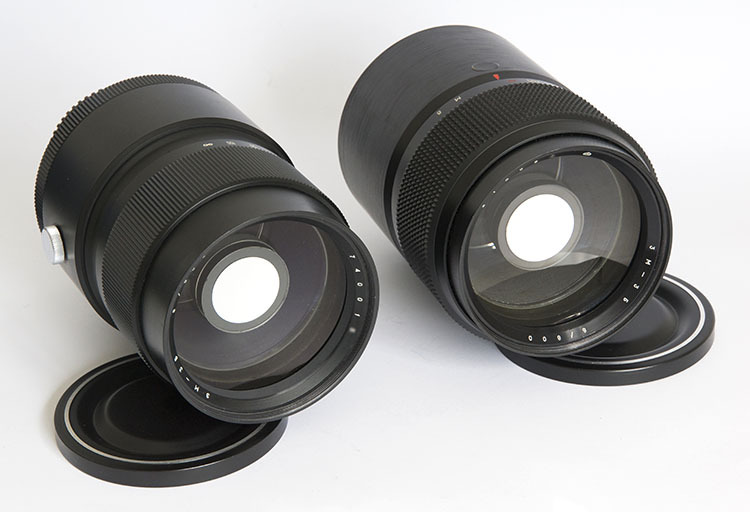 Here is a comparison of the two versions of this lens that I have seen, one of them dated 1974 and the other, 1981. There may of course be other variations. 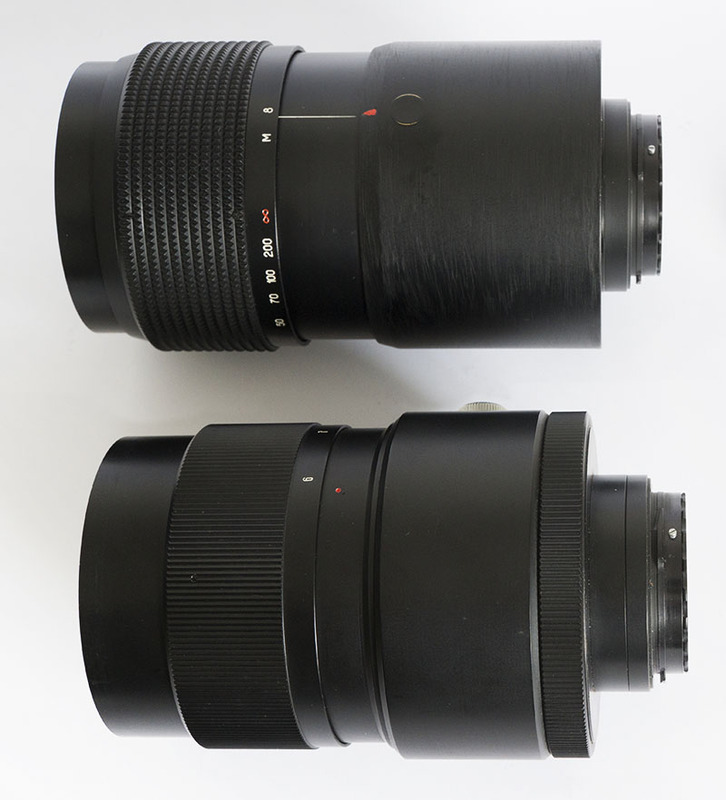 The 1974 lens is on the left, the 1981 lens on the right. A view of the underside of the two lenses (image to the right) reveals that they both have a tripod mount of essentially the same design, with a round plate of sufficient width to ensure a good trip on the tripod. The screw thread is the “Continental” 3/8" and on the older lens I have added a conversion bush down to the ¼" that is common in the UK and the USA. The presence of this socket is important, since all lenses of this focal length should normally be used on a tripod. And like all 600mm lenses, whether or not they are mirror lenses, the 3M-3B is heavy, so the camera’s own tripod socket should not be used. For the large ring, see comments above and below on this page. It is not an original component of either lens. As well as the difference between the straight "fluting" on the focussing ring in the 1974 lens and the diamond/pyramid studded focussing ring on the 1981 lens, there are a number of other significant differences. Perhaps the first difference that one notices is the chrome locking knob on the left of the older lens (as viewed from the front). This enables one to rotate and then lock a collar which contains the tripod mount. 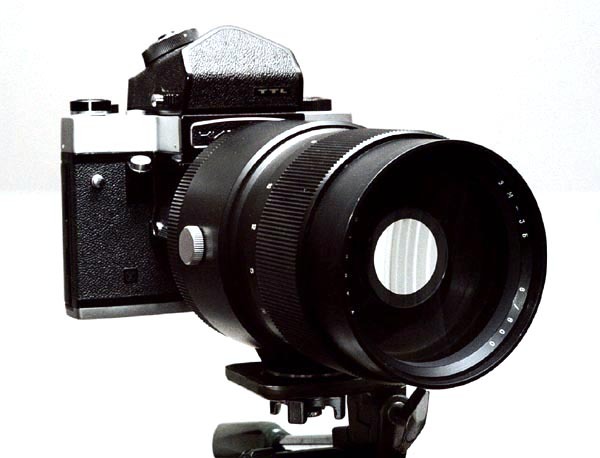 No such locking knob exists on the 1981 lens because the tripod mount is attached directly to the lens, without a rotating collar. This reduces the complexity of the components of the lens and will have simplified manufacture. 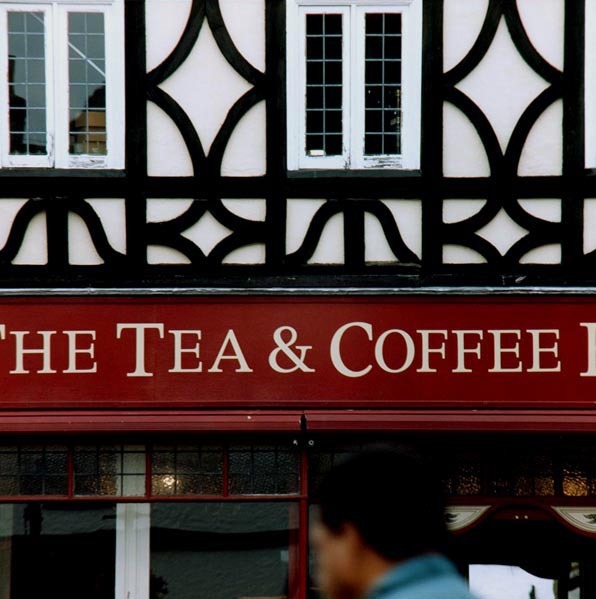 Perhaps the change was introduced to reduce costs. Or perhaps a rotating tripod mount was considered unnecessary for a lens that was designed for use on square-format cameras. In the photo to the left, it is just about possible to see the Arsenal logo on the name ring of the 1981 lens (just after “12.00 o'clock”). There is no logo on the 1974 lens. 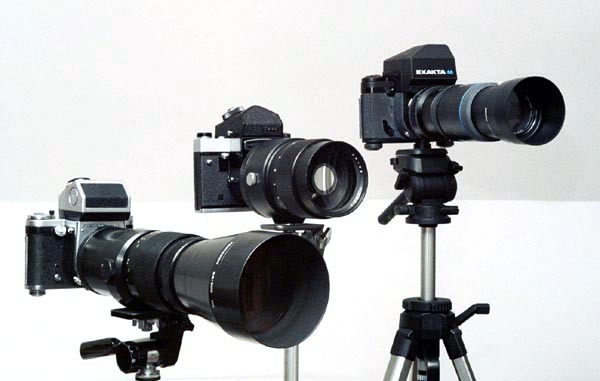 With the two lenses at the closest-focussing distance, the 1981 lens (the top lens in the picture to the right) is significantly longer than the 1974 lens. In fact, between the infinity setting and its closest focus of 6 metres, the 1974 lens only increases in length by approximately 4 millimetres, whereas in the 1981 lens increases in length by 27mm (just over 1"). The “infinity” end stop on the 1981 lens is a lot closer to infinity than it is on the 1974 lens. This means that in the case of the 1981 lens true infinity focus is achieved with a fractional turn of the focussing ring, whereas a someowhat greater turn is required to achieve infinity with the 1974 lens. The 1974 “ZM – 3B” (or “3M – 3B”?) has a much narrower diameter for the last 19.3mm before the mounting surface that mates with the camera. The diameter drops from a fraction under 115mm to 72mm. This means that the lens mounts easily on all bodies that one might reasonably expect it to fit – Pentacon Six (therefore also Praktisix), Kiev 60 (therefore also 6C), my Kiev 88 with P6 mount (Brenner’s “B.i.G. Six”) and – most significantly – the Exakta 66, even with the Schneider TTL prism in place, although this prism projects forwards a long way from the front of the camera. 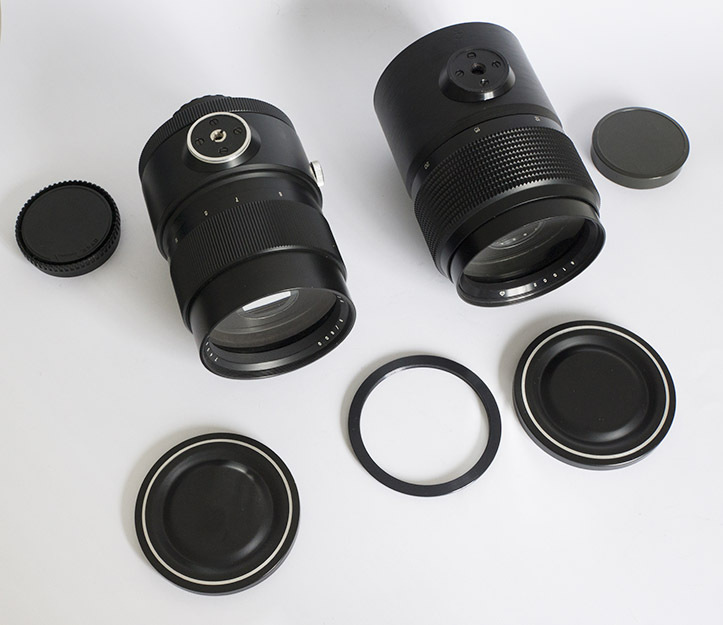 Both lenses have exactly the same system for holding a rear-mounted 52mm filter. 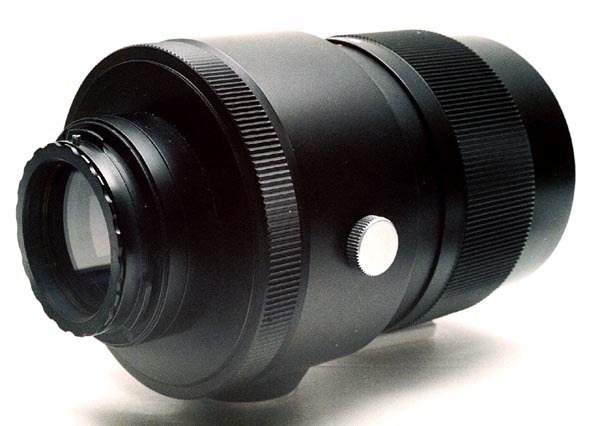 We note that behind the rotating tripod collar on the 1974 lens there is a (fixed) ribbed section. 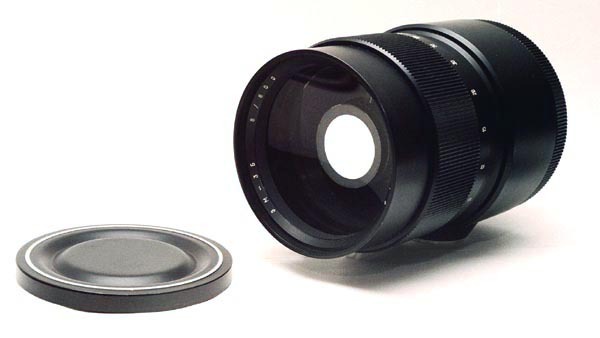 The 1981 lens has a rear section of uniform width, approximately of the same diameter as the outer surface of the tripod collar on the 1974 lens. However, this rear section is significantly longer on the 1981 lens. The rear surface of the 1981 lens is held in place with screws that are visible. The fixing method on the 1974 lens is different. Minimum focus on the 1974 lens is indicated as being just under 6 metres, whereas it is 8 metres on the 1981 lens. Frankly, anyone photographing a subject with a 600mm mirror lens is unlikely to be particularly near to the subject, so this difference does not appear to be significant. Here the 1974 lens is on the left and the 1981 lens is on the right. In the enlarged section of this picture that is reproduced to the right, I have rotated the image through approximately 180º to make it easier to see the details. 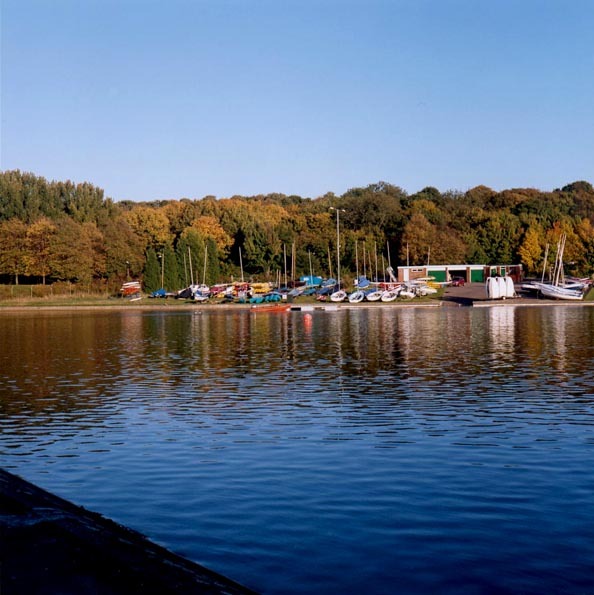 In that picture, the 1981 lens is therefore on the left of the picture and the 1974 lens is on the right, as indicated by the captions in the photo. The image on the left here enables us to observe two further differences between the two versions of this lens. First, let us look at the ring that is in front of the two lenses. This is the adapter ring that was custom-made for me by SRB. It has an outer thread of 98mm × 1 pitch and an inner thread of 86mm × 1 pitch. As explained (above) and illustrated (below) on this page, it enables me to mount the Hasselblad Professional lens shade 93 (Hasselblad reference 40726) on the 1974 version of this lens. In the image on the left it is just possible to see the thread in the front of the 1974 lens. The 1981 lens does appear to have the same thread, which is required to take the name ring. However, the thread stops a couple of millimetres before the front of the lens. 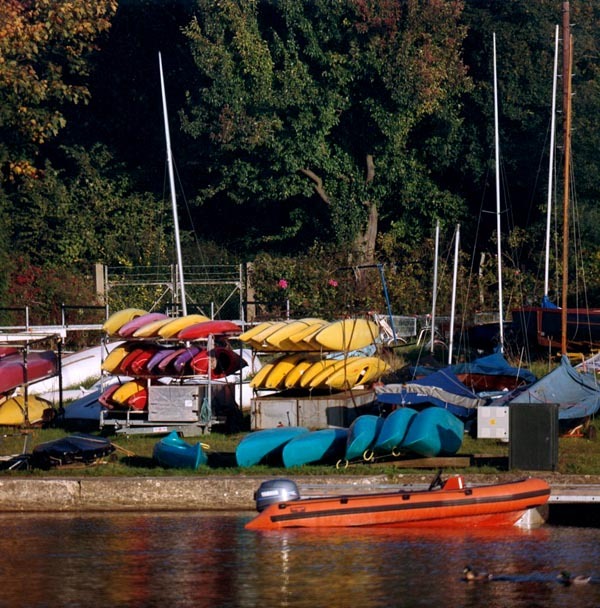 This is clearer in the following enlargement of a section of the same picture. The depth of the threaded portion of this ring is exactly right for the 1974 lens, but it is not deep enough to engage with the thread in the 1981 lens, which starts further down; a ring with a longer step portion would be required – not a problem, of course, for experts like the people at SRB. It appears that most of the new “3M-3B” lenses that can occasionally be found for sale do not have a front filter thread on the lens. The logic of this is clear: a 52mm filter should be fitted at the back, rather than a 98mm filter (probably unobtainable) at the front. 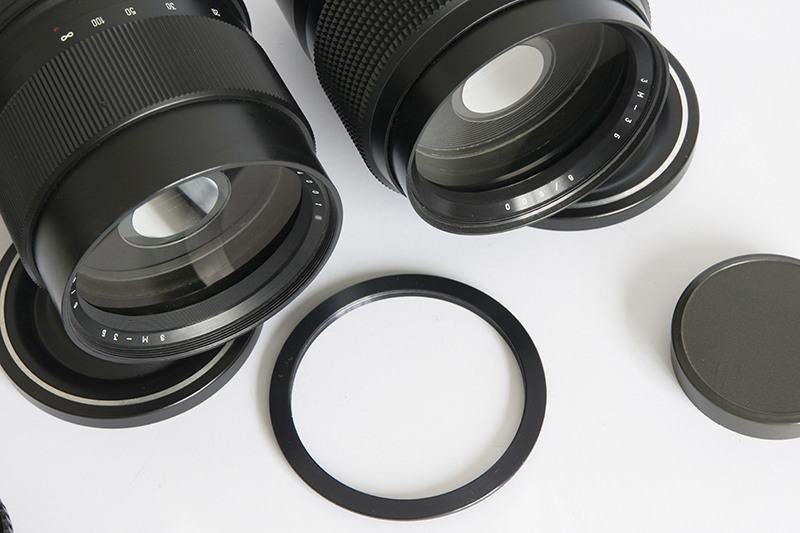 However, the absence of a front filter thread prevents the mounting of a lens shade. 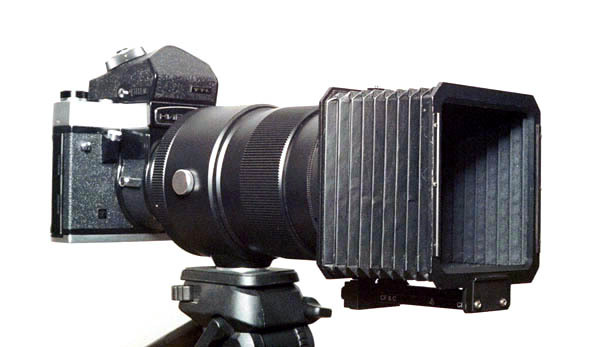 Nevertheless, one user says that he does not find this a problem; he attaches some thick black paper to the front of the lens with a rubber band. It is cheap, lightweight, folds flat for carrying, and does the job perfectly, not even needing to be rotated if the focus is changed! It may be that the detail revealed in these photographs shows that it should be possible to mount a suitable, custom-manufactured ring to the front of the newer versions of this lens. Or of course it may be that the lens that my correspondent had acquired did not have even this small amount of thread in front of the name ring, in which case, his solution with a thick piece of black paper and a rubber band is the way to go in order to get a lens shade! The other difference between the two lenses is also visible in these photos. 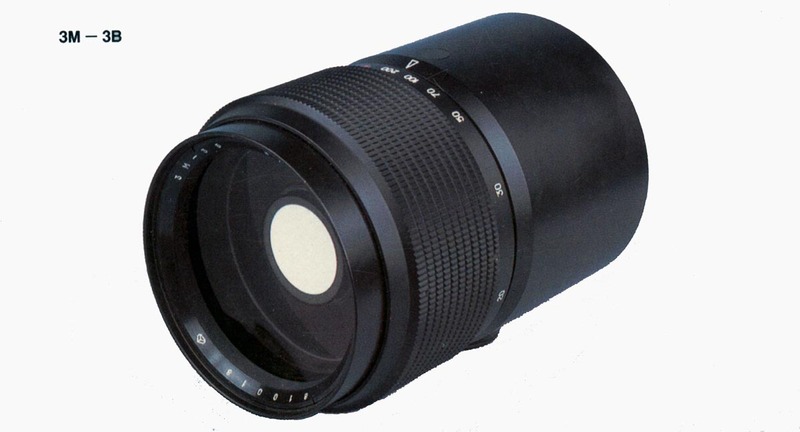 The shape of the letters on the 1974 lens indicates that we should indeed call it “ZM-3B” (in English script), while the shape of the letters on the 1981 lens indicates that the lens was by then designated “3M-3B” (the same as in the 1989 Technointorg catalogue from Moscow). The mirror lens has yet to be tested in the same setting as the other lenses, although I have taken tests in a different location. Here are my findings. This lens is capable of producing EXTREMELY sharp images, but of course the depth of field is quite limited, so precise focussing is essential. I tested for flare by shooting pictures of a lake with the sun reflecting off the water into the lens. This worked quite well, but reflections from the water of direct sun shining into the lens produces totally unacceptable arc-shaped reflections. This lens really does need an efficient lens shade for use when shooting towards the sun or other bright light sources. Shielding for the lens can be further improved by adding a mask to the front of the lens shade. My shade came with masks for 120/150mm and 250mm lenses. It will not be difficult to modify one of these masks (by reducing the opening) to give maximum shading for the 600mm lens. 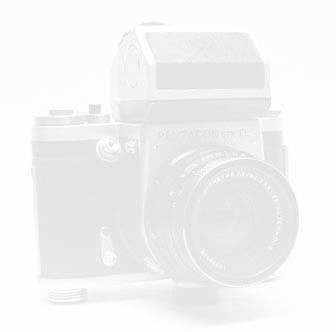 When doing this, I plan to mount the lens on the Kiev 88-6, with the ground-glass screen and magnifying hood in place of the film magazine, to eliminate any possibility of viewfinder error. The next image shows the masks as supplied. [C06- 2: 500-600mm: what they look like together.